When I was studying piano and classical guitar back when I was still attending classes in Benedictine Abbey School, I remember how it was to line up and wait for my cue to perform. Today, my son is experiencing the same thing for the third time, another step closer to what I hope to be the development of a future violin virtuoso. While waiting for everything to unfold, I’m currently listening to the MSE Orchestra (one of my past clients for sheet music preparation and music transcription). They are performing the kind of stuff they do best: pop songs reconfigured for strings, piano and flute. 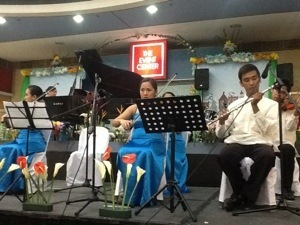 As expected from professional musicians with years of experience, they are excellent performers. The repertoire, however, is reflective of the sad state of the musical tastes of many Pinoys: instant entertainment that drives the emotions and the feet rather than the mind. Perhaps in as much as MSE and the ensemble would like to perform something artistically gratifying (which they do on occasion), they need to keep a business running, and this is why at this instant they’re churning out what I call canned music. It’s like Muzak being performed live. Don’t get me wrong. I have great respect for the musicians themselves. It’s impressive how they produce renditions of hits, chamber orchestra style. The pianist’s improvisations are spot on, and the rest of the orchestra play their instruments as if they were just brushing their teeth. However, as much as I’d wish to hear them play stuff like Penderecki, Bach, Debussy, Liszt, or even Wagner, it’s unfortunate that I won’t get the chance to do so. So canned music it is for now. The set is just bad here at SM Bicutan. If I were Ric and Mariza (MSE’s owners), I’d be really pissed off. First thing is that MSE plans to serve lunch. The assholes at SM failed to provide tables. How are the guests supposed to eat lunch? Minutes after writing this, I see some tables being set up. I’m hoping that they’d put in enough tables for everybody. Second problem is the awful slide in the middle that just gets in the way of the audience. If I was shelling out tons of cash to rent the place for a few hours, I’d expect it to be put out of the way, no excuses. In a few moments from now, my son would be performing a Gavotte by P. Martini, one of the standard pieces found in the Suzuki Violin School Literature. He could already pull off pieces like Antonio Vivaldi’s Concerto in A minor. However, it seems to me like because of the Suzuki methodology, he has to go through recitals in chronological order of the books. Since it’s his 3rd year of playing the violin, he’s playing something from book 3 I believe. Maybe he’ll have a better chance of demonstrating his skills in the School of Tomorrow’s Junior Student Convention in 2014, an event he’ll prepare for after this. Now I’ll be stopping my critiques and do my best to enjoy the rest of the day. So, I’m guessing that I’ll be expecting the same stuff year after year: classical music from students and canned music from the pros. Maybe if my son goes into another program things might change. It’s a good thing that my son is learning from the pros but I hope I could find an opportunity for him to go for higher artistic goals, the kind of stuff that people like Coke Bolipata would go for rather than play canned music. Well, performing canned music would help pay the bills but musicians need to go for dreams way bigger than that. I will be candid and honest here. I find it very annoying and irksome when people ask me why I only have one child and have decided never to have another one. These sort of people go on with their reasons that the child might become unhappy, lacking in social stimulus, and all of those same tired illogical reasons to having more than one child. 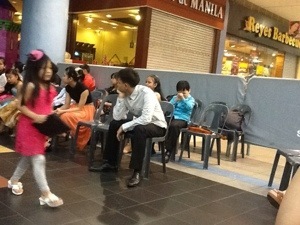 I explain my reasons to them (along with my reasons for homeschooling and other lifestyle choices), they seem very baffled given that it goes against much of the traditional Filipino culture norms (machismo, two or more children, head of household working in some big corporation, etc.). I’m being honest here when I state such reasons. I wouldn’t answer you with some answer that would come across as hypocritical. I would not lie as well when I tell you that I cannot fulfill the third reason if I had more than one child. Should I then try to have another child? If I did, the likelihood of ruining the life of my son and that hypothetical child would be great indeed. To clarify a few reasons for having only a single child, let me describe to you two of God’s creatures and how they differ: the eagle and the rat. The eagle is a creature that has such high esteem. It is an apex predator, a high-flying bird that rules the air with telescopic vision, sharp talons and a powerful beak. They tend to build their nests in high places. Once an eagle finds its mate, it is for life, an example of monogamy in the animal kingdom. Reproduction tends to be minimal with only about one to three eggs in the nest. In many cases, only a single eaglet succeeds to go on into adulthood. To me, an Eagle represents a vision of going to what seems to be unreachable heights, of dreaming big and doing something noble in life. The rat, on the other hand, is usually a prey animal. It has poor vision. It’s survival as a species depends on being able to reproduce rapidly, often with multiple partners. It may be crafty but its no apex predator and is always on the lunch menu. It dwells in dark places where they can scavenge for food easily, acting as a pest inside human dwellings. I’m not surprised of the fact that the rat is often used as an analogy for a state of being destitute. Following the model of an Eagle makes more sense to me because it espouses the “quality over quantity” concept. Being an “eagle” allows me to provide full resources to a single offspring which improves the chances of that child having a superior level of upbringing. My child would have a better chance of avoiding the kind of problems that Alfred Adler describes in his theories regarding birth order. My son enjoys the diversity of social interaction he gets without being pigeonholed into peers of the same age group. He can therefore have the mentality of an apex predator that would not follow the whims of the herd. It’s the same kind of mentality why I ventured out to become my own boss rather than dwelling in corporate slavery. If you talk about “rats”, they’re everywhere. Take a tour of downtown Manila and you’ll readily see what I mean. Go to the Dr. Jose Fabella Memorial Hospital, and you’ll get a clear picture of how dysfunctional the rat mentality is. There are many people who still have the mistaken belief that children are living insurance policies; in many of these cases, such children turn out to be liabilities as their inept parents are not capable of equipping them well. Now you know why I choose to be an eagle rather than a rat. I don’t want to be on some other predator’s lunch menu, and I don’t want my son to become prey either.